After one delicious bite, you'll be unable to resist the temptation to eat several of these scrumptious, buttery holiday cookies topped with a glaze loaded with peppermint flavor. Combine 1/2 cup of powdered sugar, 1 cup butter and 1/2 teaspoon of peppermint extract in a large mixer bowl. Beat on medium speed, scraping down the sides of the bowl until creamy. Lower the speed to low, add the flour and cornstarch. Using your hands, form dough into a ball and wrap it in plastic wrap and refrigerate until firm, approximately 1 hour. Heat oven to 350Â° F.
Shape dough into one inch balls and place one inch apart onto an ungreased cookie sheet. With the bottom of a round glass, press each cookie down slightly. Bake 12-15 minutes or until the edges are lightly browned. 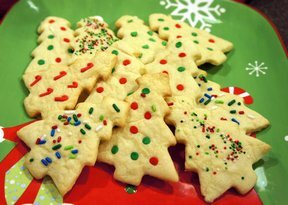 Allow them to sit on the baking sheet for one minute before removing them to a cooling rack. 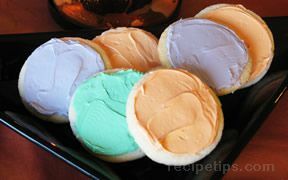 Spread a small amount on top of each cookie. Sprinkle immediately with crushed candy. "Submitted by:woodquail1 Date: 2009/12/21 I didn't try the recipe last year because of the the tiny amount flour which I see has been corrected. Thank you to the Forums Moderator. I will try them now." "There was a typo on the amount of flour on this recipe. We fixed the problem and the recipe reads correct. Sorry for the inconvenience!" "This recipe must be wrong. How can you get cookie dough consistency with all that butter, powdered sugar and only 1/2 tsp of flour? Could the flour and cornstarch be mixed up in the print? This felt like frosting. I tried to cook it anyway and I had a pan of melted butter and sugar. Yuck." 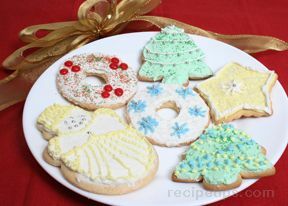 "These cookies were easy to make and they have a terrific peppermint taste." 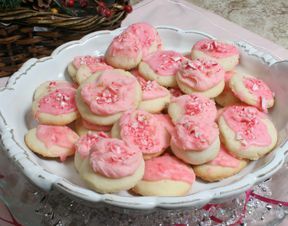 "The crushed candy canes in the frosting really give these cookies great flavor and texture." "I thought the cookie was a little dry but the frosting was delicious!"